Today I went to see the Robert Capa photo exhibition in Verona. 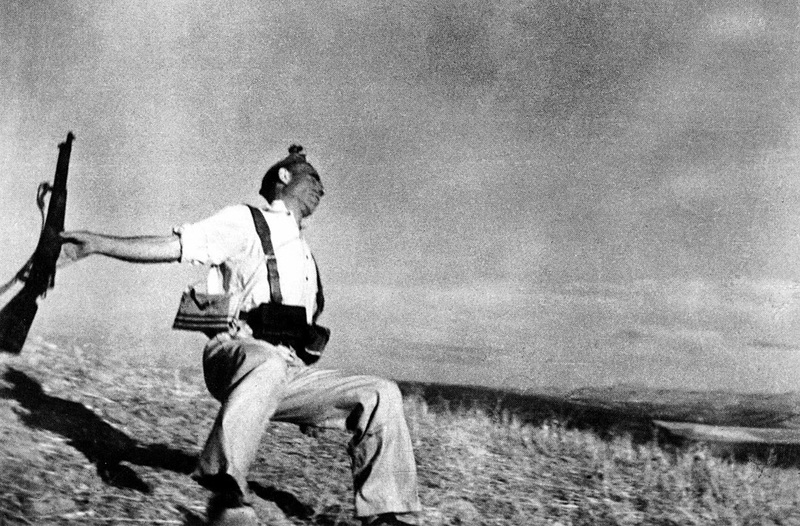 Organized by Magnum Photos, the historic photographic agency founded in 1947 by Robert Capa himself, the great French photographer Henri Cartier-Bresson and other great photographers of that time, the Verona photo exhibition intends to pay homage to Robert Capa, one of the most influential photographers of the 20th century. The Verona exhibition presents some of the crucial moments of the history of the past century, documented by Robert Capa during his many trips. Almost one hundred photogaphs are shown, all B&W, which represent a compendium of Capa's work over a quarter century. Born in Budapest in 1913, Robert Capa (born Endre Friedman) started working as a photographer in Berlin, and soon got in contact with an important photographic agency. With the rise of Hitler Robert Capa left Berlin and followed his restless soul across Europe until the start of World War II when he decided to move to New York and started working for “Life”. The earliest pics are the photos taken in 1932 during the Leon Trotsky conference in Copenhagen, when for the first time the violence of Stalin regime was exposed. We then move on to the Paris riots of the late 1930s. 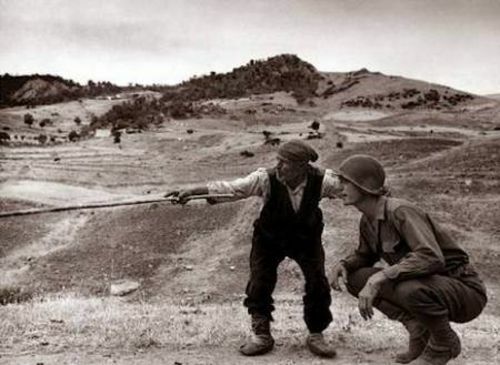 Capa then goes to war: first the Spanish civil war, then the Japanese invasion of China and finally the Second World War, where he followed the Allied landings in Sicily and then D-Day. On that fateful day he took over 500 pictures, but only a dozen or so survive because a technician screwed up the development of the rolls he sent back to England! The exhibition in Verona also contains a display of photos showing some of Robert Capa’s friends, such as Hemingway, Faulkner, Matisse and Picasso. We can also see photos taken in the Soviet Union in 1947, as well as the founding of Israel and finally his last photos taken in Indochina, where Robert Capa travelled to document the independence war and where he was killed in a mine field on 25th May, 1954. Finally we see pictures of his lover Ingrid Bergman. I always loved his most quoted teaching to photographers around the world: "If your photographs aren't good enough, you're not close enough." He certainly did get close to the action. He risked his life in many a war theater, often at the front line, and eventually died doing so. It is then surprising that he seems to have faked the most important image of his entire career. But then, at that time he was not a famous photographer. He was trying to scrape a living and might have given in to the temptation of creating a moving image when he could not find one. I had a conversation with the exhibition guide about the famous picture of the "death of a militiaman" or "falling soldier". She argued it is genuine, the true instant when the loyalist militiaman was shot dead by Franco's forces. The picture has been controversial for a long time, but now the majority of scholars agree it was most likely staged. Another argument is about whether or not, if the photo was indeed staged, Capa was nonetheless justified in publishing it to send a political message. In my view, he was not. There is a difference between a mock image and a fake one, as it has been argued very well in this article (in Italian). Some disagree, like my guide today. 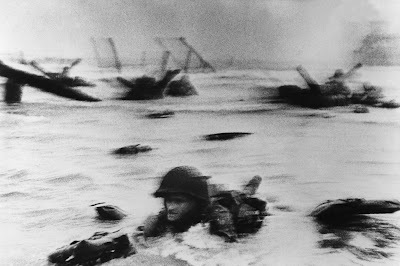 One famous article to argue that Capa's photograph was not staged was written by Robert Whelan in 2002. Be that as it may, Capa remains a towering figure of photography. Another of his quotes I like, and try to implement in my travels, is: "Like the people you shoot and let them know it." Here is his autobiographical essay on his work at the front.